I join a group on Facebook called Baking Wonderland, and people pose all kinds of delicious food photos all the time. This cheesecake recipe comes from Baking Wonderland. 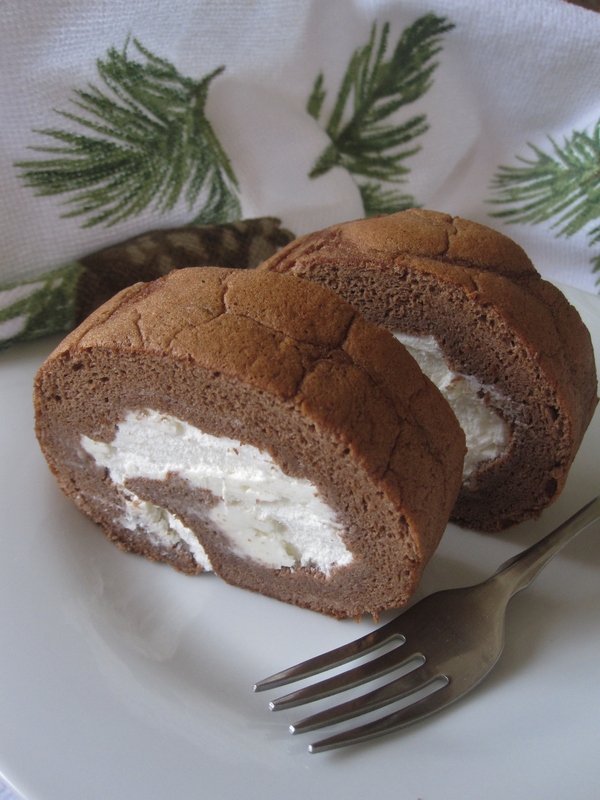 What caught my eyes was that it uses only 3 simple ingredients: cream cheese, chocolate and eggs. Yes, very simple. Flourless and oil free too. 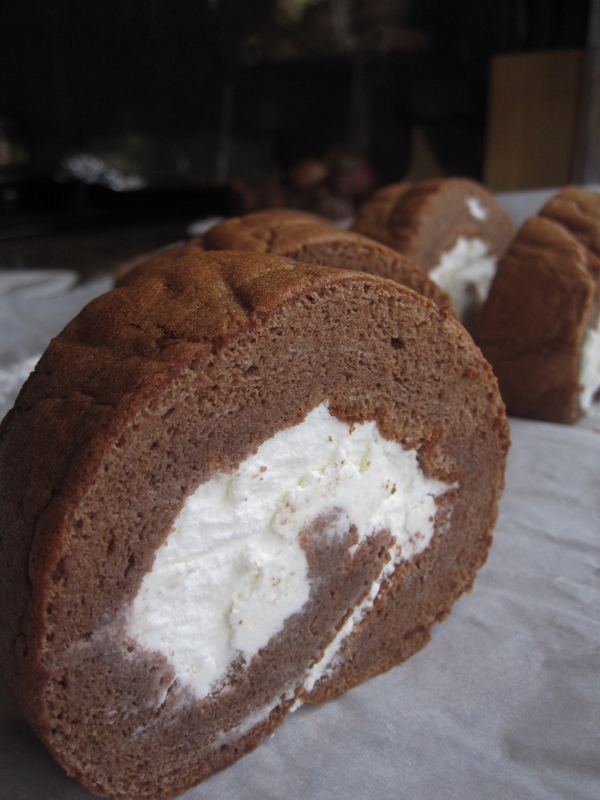 Original 6-inch cake recipe calls for 3 eggs, 120g cream cheese and 120g chocolate. Since I don’t have 6-inch cake pan, 1 block of cream cheese in U.S. is 220g, and 1 package of chocolate chips is 10 oz, I figure I will just kinda double up the recipe to fit my 9-inch cake pan , and conveniently save my time measuring the amount of cream cheese and chocolate chips. I could hardly wait for the cake to chill so I could try the taste. But… uh oh! 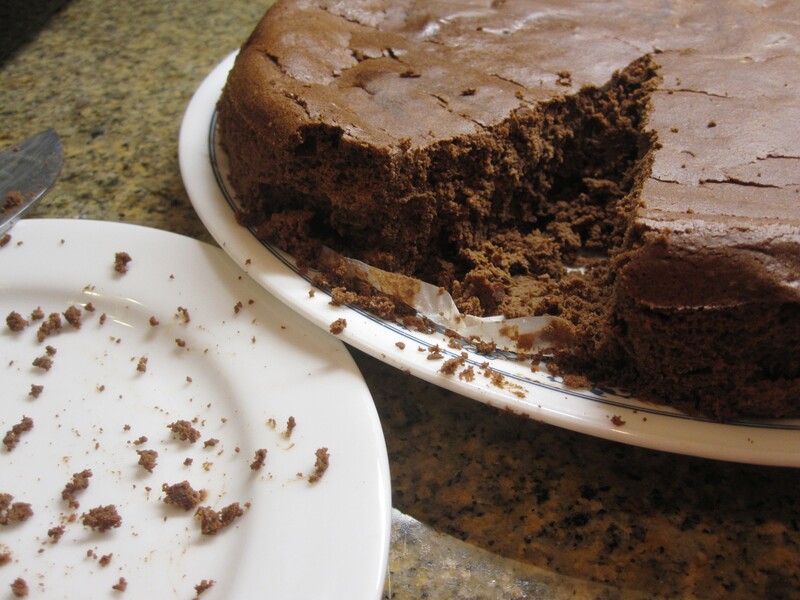 The cake was a lot denser than I expected, and it was just too crumbly– I just couldn’t make a nice cut at all. My mood went straight down to the bottom. 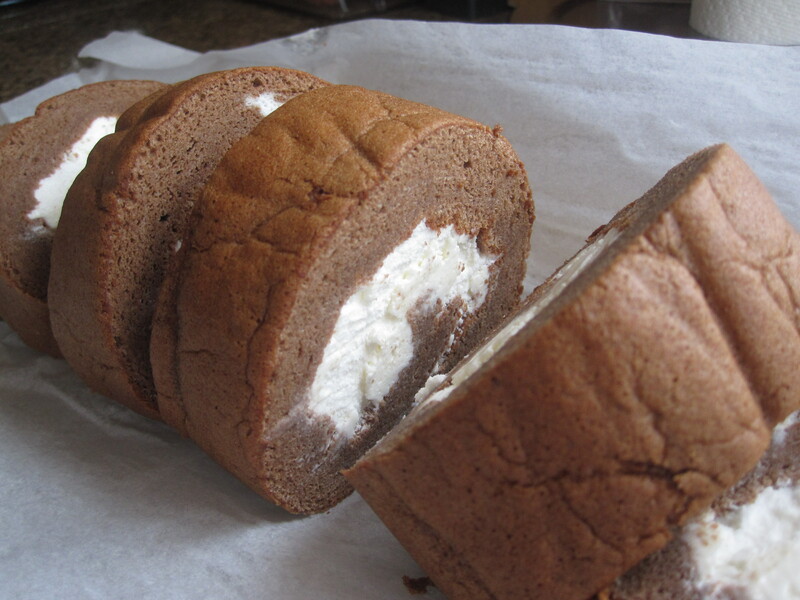 The taste was good though– rich creamy chocolaty with a tangy flavor from the cream cheese. At the end, we finished this big piece of “chocolate crumbs”. Consider its simplicity, I might try making it again. Preheat oven to 350°F. Arrange oven rack to lower 2/3 (so the cake bakes in the middle of the oven). Boil a pot of water. Line the bottom of a 9-inch springform cake pan with parchment paper. Then double wrap the bottom of cake pan with foil (or put cake pan in a larger shallow pan). Prepare another large roasting pan for the water bath. Put cream cheese and chocolate chips in a double boiler over medium heat. Stir until it melts half way. Remove from the heat and continue mixing until all blended well. The mixture will be dense and sticky. Add in egg yolks, one at a time, and mix well to combine. The better will look smoother. Whip egg whites on high speed (KitchenAid Stand Mixer speed 8) until no visible clear egg whites. Add in cream of tartar or lemon juice, continue on high speed (speed 8). When the egg whites become meringue looking, turn down the speed (speed 6) so it whips out big air bubbles, whip for another 2-3 minutes until pointy peak forms. Gently fold in whipped egg whites into egg yolk mixture, in 3 batches, until all blended well. Pour batter into springform pan. Smooth the top. Add boiling water to the roasting pan (water level is about 1-2 inches high), then put cake (if using larger shallow pan: springform cake pan in shallow pan, then together in the roasting pan) in the roasting pan. Bake for 15 minutes. Reduce oven temperature to 325°F, for 15 minutes. Then reduce further to 300°F for another 15 minutes. The cake should be done at this point (toothpick/skewer inserted into the cake center should come out clean). Remove from the oven. Cool completely before chilling in the fridge. Served chilled for best flavor. Preheat oven to 350°F, place a oven rack in the middle of the oven. Line the bottom and 4 sides of a 15 x 10 x 1 inch jelly roll pan. Combine cake flour mixture. Sift in cake flour in 3 batches, mix well until the batter is smooth after each addition. Add in rum, mix well again. Transfer the cake (with parchment) onto a cooling rack. Flatten out parchment paper on 4 sides of the cake. 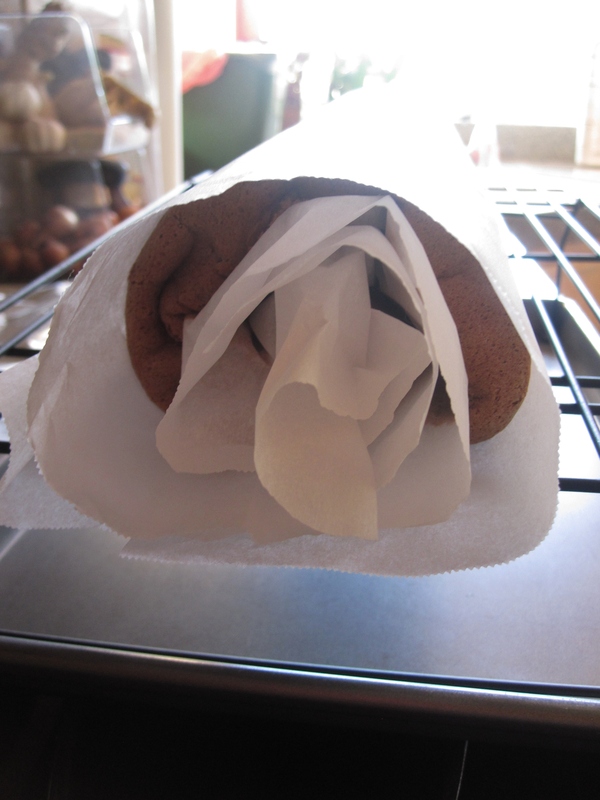 When the cake is cooled, place another piece of parchment paper (larger than cake) on top of the cake. Carefully and quickly flip cake and 2 sheets of parchment papers over (so the cake crust will face out when rolled up). Now the cake bottom is facing up. Remove parchment paper liner. Brush coffee+rum mixture on the surface if desired. Spread tiramisu cream evenly on the cake. 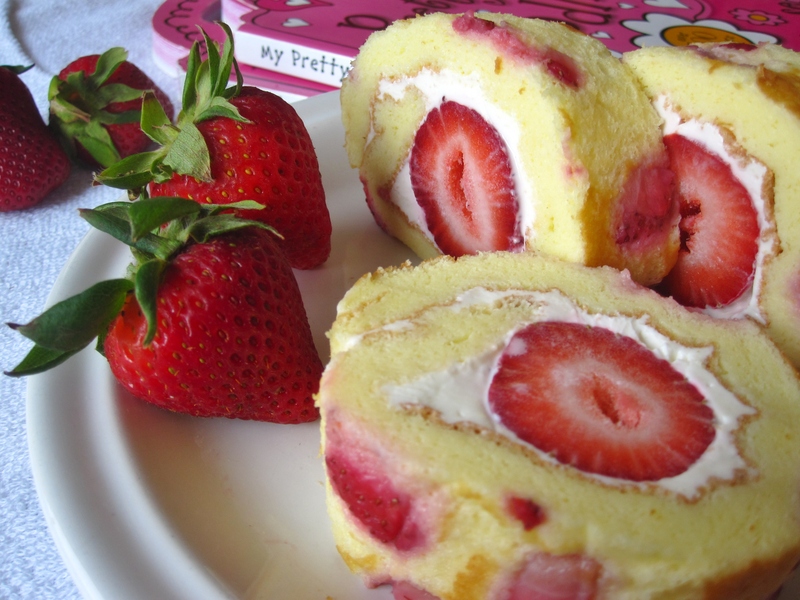 With the short side facing you, roll up the cake like a jelly roll. 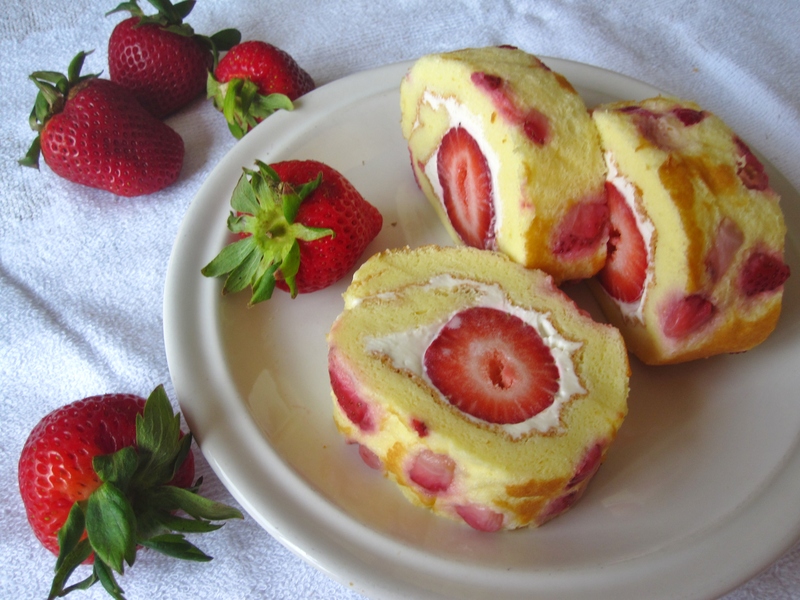 Wrap the cake roll in the parchment paper and chill in the fridge before serving. Before slicing each piece, run knife in hot water and wipe dry with a paper towel to ensure a nice clean cut. 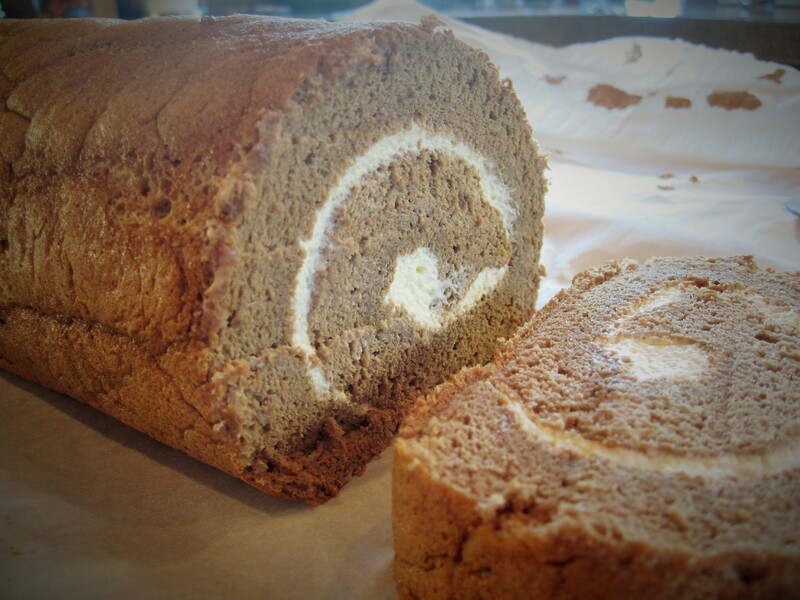 Tiramisu cream— since cake roll only requires 3/4 cup of tiramisu cream, I don’t border making it purposely. I just save some cream when I make tiramisu for the cake roll. 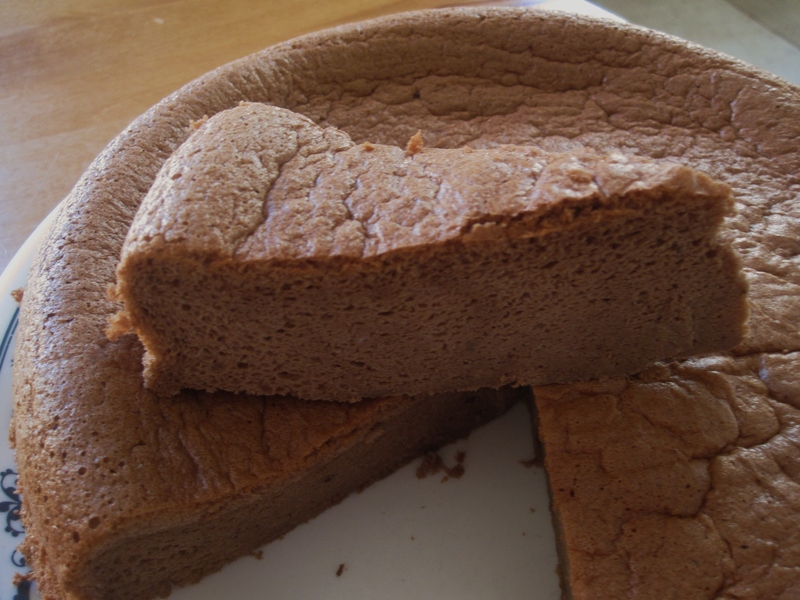 We ran out of breakfast food, so I decided to make chocolate Ogura cake again– I want to fine tune the recipe before it slips out of my mind. 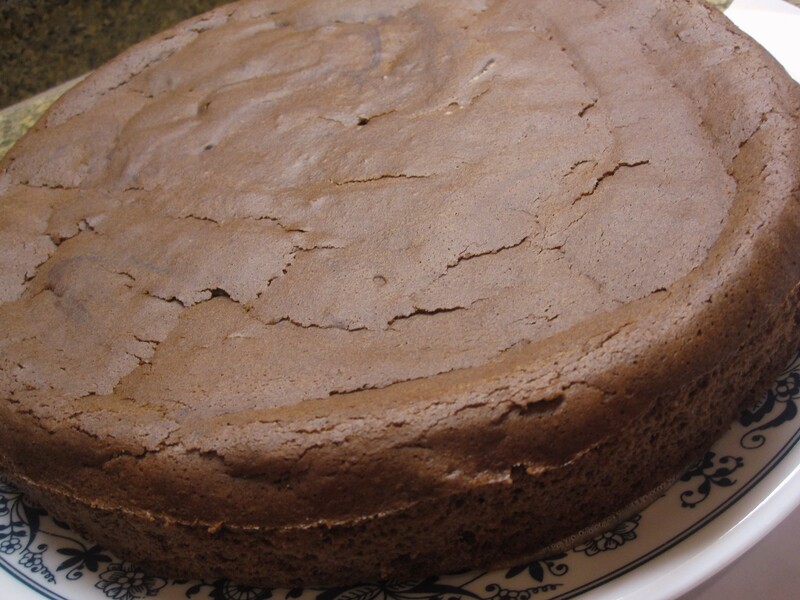 Last time, my chocolate Ogura cake was for a 9-inch round cake pan, and it didn’t last my family long. 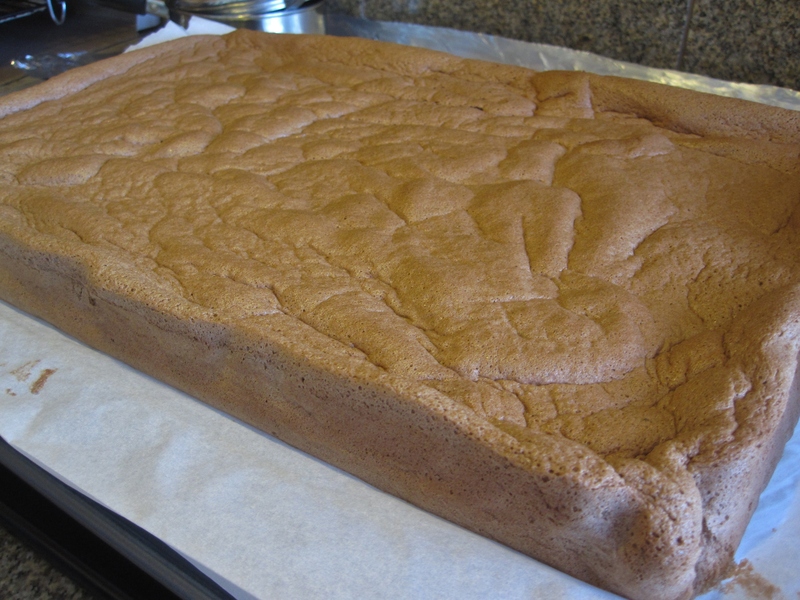 So this time I decided to make it larger– to fit a 9x13x2 inch cake pan. I have adjusted the ingredient proportion. Also, learning from last time when I steamed bake my cotton soft Japanese cheesecake #2, my water pan was too shallow (I used a small jelly roll pan). As a result the water dried out during baking and possibly causing big cracks on the top of the cake. So, this time I used a more shallow pan to hold the water– a 9x13x2 inch Pyrex glass pan with water filled half way up, and it worked out fine this time. The cake batter didn’t spilled over. It rose very nice during baking– then the top started to crack when it got closer to upper heat source (I place the cake in the middle rack this time). Originally I set the baking time to be 50 minutes at 325°F and planned another 5-10 minutes at 350°F, but when I checked the cake after 40 minutes/325°F, the top cracked pretty badly and I had to remove the cake from the oven (after the toothpick-comes-out-clean cake test). Next time I should try position the cake at the second lowest rack in the oven, right above the water pan. Unlike last time, I let the cake cooled, inverted and inside cake pan, completely before removing from cake pan. What I found out is that there’s a lot of air trapped at the bottom of the cake (between the pan and parchment paper)– as soon as I make a slit cut along cake pan to unmold, the cake started to sink into the pan. Luckily the cake didn’t shrink. Upon removing parchment paper, I was glad the bottom of the cake was not soggy wet! The taste is pretty good, not overly sweet and full of chocolate flavor, although a much richer chocolate flavor would be better (yes, I was looking for rich chocolate flavor of a molten cake! 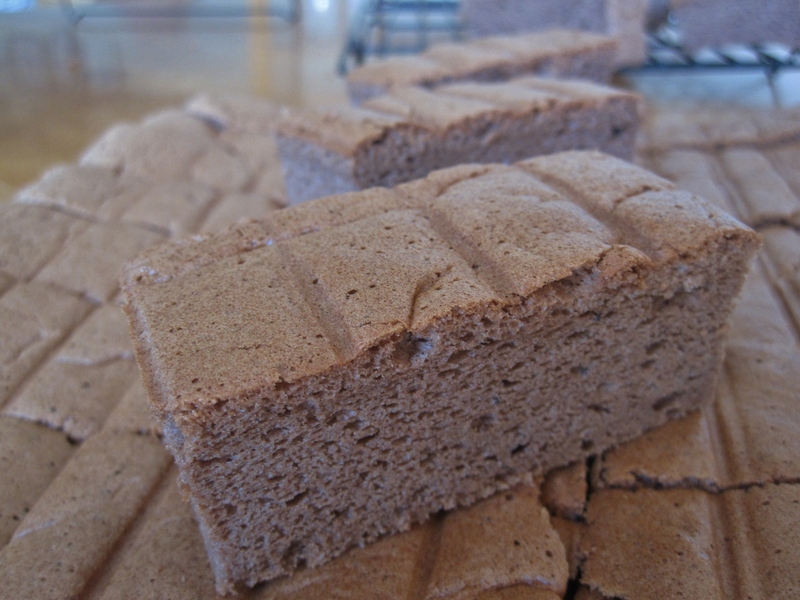 )… maybe adding more chocolate chips and/or more cocoa powder and less cake flour? 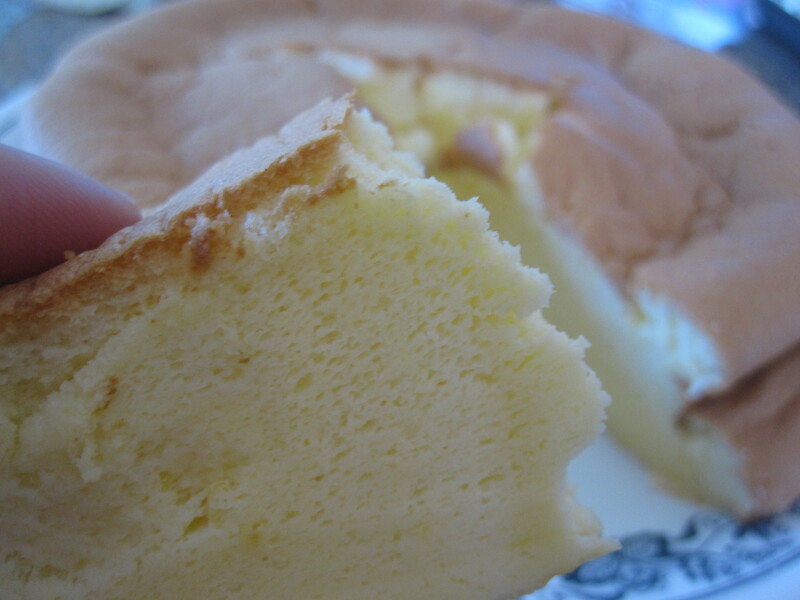 The texture is very very soft– I think it’s the softest cake I have ever made! It’s fluffy and light too, a delight to bite into! But the cake crumb is not evenly fine– some part of the cake has finer crumbs, but other parts have bigger holes. Preheat oven to 325°. Fill a shallow tray with tap water to half way and place the tray on the bottom rack. Place another rack in the middle of the oven– this rack is for the cake. Grease and line the bottom of a 9x13x2 inch cake pan. Place chocolate chips and milk in a big bowl over a double boiler, until the chocolate melts. Alternatively you can melt it in microwave (I microwaved for 30 seconds and continued melting on double boiler). Remove from heat. Use a balloon whisk to whisk in salt and oil until well blended. Cool slightly. With a silicone spatula, gently fold in whipped egg whites to the yolk mixture in 3-4 batches, be sure there’s no egg white lumps in the batter. Pour the batter into cake pan slowly (this will avoid big air bubbles and last check for any egg white lump in the batter). Tap cake pan once. Bake for 40-50 minutes. Remove from the oven and inverted the cake on a cooling rack. 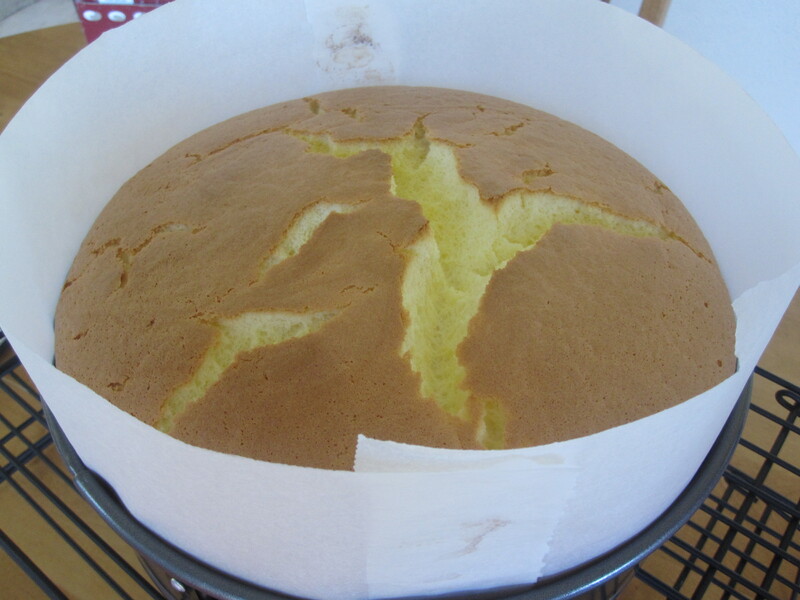 Remove cake from the pan when it is cooled completely. Chocolate flavor: Not rich enough for me. Next time should increase amount of chocolat chips and/or more cocoa powder (up to 4 tbsp?) and possibly less cake flour? Cake height: After baking and cooling completely, the cake is about 1.5 tall. Cake position in oven: Next time try positioning the cake at the second lowest level, right above the water pan (so away from upper heat source and possibly less chance of cracking on the top); or even try placing the water pan on the second highest level and cake being at the second lowest level.